Founded by Herbert von Karajan in 1967 to celebrate great works of the operatic and orchestral repertoire, the Salzburg Osterfestspiele brings together high musical standards with refined ambience on one of the world’s biggest stages. Over six days at the festival attend seven performances of operatic, orchestral, choral and chamber music concerts including Wagner’s Die Meistersinger von Nürnberg, conducted by Artistic Director Christian Thielemann. Begin and end your tour in Vienna with four opulent opera productions at the Vienna State Opera, including Beethoven’s Fidelio, Puccini’s Turandot, Wagner’s Parsifal and Strauss’s Salome. Depart Australia or New Zealand on suggested Qatar Airways flights to Vienna via Doha. Renaissance Tours or your travel agent can assist you with your flights and other travel arrangements. Arrive in Vienna and make your way to the hotel. In the early evening, join Marshall and fellow travellers for a welcome briefing followed by a an early dinner. Then, begin your opera experience with a performance of Puccini’s opera Turandot by the Vienna State Opera, with Russian mezzo-soprano Anna Smirnova in the eponymous role. Check out of the hotel and leave Vienna for Salzburg. In the evening, attend the first of the Easter Festival performances in the Great Hall of the University of Salzburg. Home to Salzburg’s musicians and composers from the mid-17th century, this auditorium was where Mozart’s opera Apollo et Hyacinthus was premiered in 1767 when he was aged 11. Attend the world premiere of Thérèse, a chamber opera composed by Phillip Maintz based on the famous novel by Émile Zola of murderous lovers, ghosts and tragic ends. This morning, attend a pre-performance talk by Marshall on the upcoming days’ performances. Then, depart for a walking tour of Salzburg’s Old Town before lunch at a local restaurant. In the evening, enjoy a performance at the Großes Festspielhaus, one of the largest opera houses in the world. Tonight’s performance features violinists Frank Peter Zimmermann and Serge Zimmermann with the Sächsische Staatskapelle Dresden for concertos by Bach alongside Mozart’s Sinfonia concertante in E flat major. Spend a day at leisure discovering the city of Salzburg, famous for its preserved Baroque architecture, resplendent in its towering cathedrals, palaces, fortress and gardens. Tonight, return to the Großes Festspielhaus for Dvořák’s Stabat Mater. Under conductor Christoph Eschenbach the Sächsische Staatskapelle Dresden, festival orchestra-in-residence, is joined by the choir of the Bavarian Radio Orchestra for Dvořák’s musical ode to loss and lament. Begin today with a pre-performance talk by Marshall covering the following days’ performances. Enjoy the remainder of the morning at leisure, with a suggestion to visit Salzburg’s colourful Easter markets. In the afternoon, attend a chamber music performance in the elegant surrounds of the Stiftung Mozarteum Great Hall, of art nouveau and late Baroque design, for works by Schubert, Schönberg and Beethoven, featuring musicians of the Staatskapelle Dresden. After an early dinner at the hotel, enjoy an evening performance in the Großes Festspielhaus. Featuring soloist Frank Peter Zimmermann for Mendelssohn’s Concerto for Violin and Orchestra, the programme also includes Schubert’s Symphony No. 9 and a new orchestral work by Russian composer Sofia Gubaidulina. After a morning at leisure, enjoy a special Easter lunch at a local restaurant. This evening, return to the Großes Festspielhaus for a symphonic concert of Haydn’s ‘Military’ Symphony No. 100 and Mahler’s Symphony No. 4, with soprano Regula Mühlemann joining the Staatskapelle Dresden. After breakfast, join Marshall for a pre-performance talk on the coming days’ performances, with the remainder of the morning at leisure. In the afternoon, depart for the final concert of the Salzburg Easter Festival – Wagner’s opera Die Meistersinger von Nürnberg. Only the second production of Die Meistersinger to ever be performed at the Salzburg Easter Festival, this performance is conducted by Christian Thielemann, and brings an exceptional cast comprising of Georg Zeppenfeld, Vitalij Kowaljow and Christa Mayer to the respective roles of Hans Sachs, Veit Pogner and Magdalena. Check out of the hotel and return to Vienna. Arrive in Vienna in the mid-afternoon. This evening, depart for the Vienna State Opera’s performance of Beethoven’s opera Fidelio. Beethoven’s only opera, the work explores late 18th century ideals of freedom, equality and fraternity. Under the baton of renowned European conductor Adam Fischer, this production stars Anne Schwanewilms as the heroically-disguised Fidelio and Brandon Jovanovich as the imprisoned Florestan. In the morning, attend a pre-performance talk by Marshall on the coming days’ opera performances. Then spend the remainder of the morning exploring the historic city of Vienna at leisure. Commencing in the afternoon, enjoy a performance of Wagner’s Parsifal, conducted by the esteemed Valery Gergiev. An epic tale with sublime musicality, this performance features a stellar cast including Matthias Goerne as Amfortas, Simon O’Neill as Parsifal, and Boaz Daniel as Klingsor. This morning, travel to the Lichtenstein City Palace, the first major building built during the High Baroque age in Vienna, and still owned today by the royal family of Lichtenstein. Discover the art collection of the palace with an exclusive private guided tour through the palace’s opulent neo-Rococo interiors. Afterwards, enjoy a special farewell lunch at a local restaurant with Marshall and fellow travellers. This evening, return to Vienna’s opera house for a production of Strauss’s opera Salome. 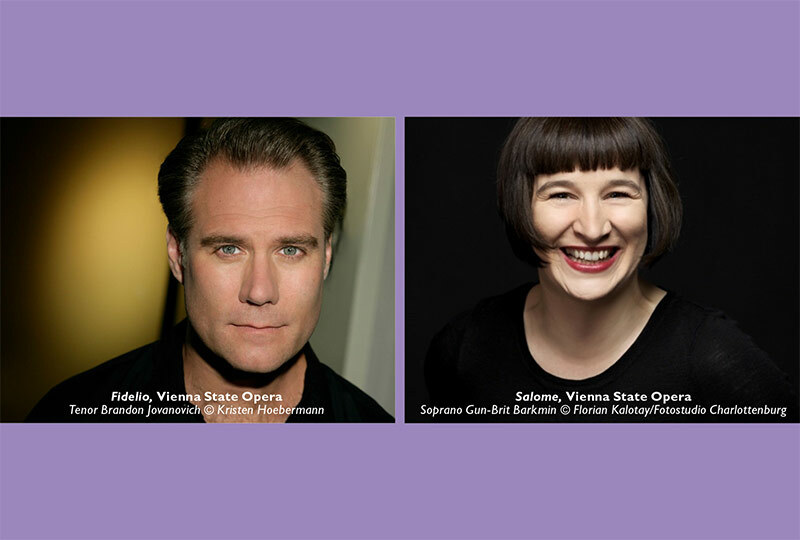 Singing the role of the infatuated Salome is German soprano Gun-Brit Barkmin, with Herwig Pecoraro in the role of the lustful Herod, and Markus Marquardt as the ill-fated Jochanaan. For those returning home today, suggested Qatar Airways flights to Australia and New Zealand via Doha. Renaissance Tours or your travel agent can assist you with your travel arrangements, including extra nights’ accommodation. Australian and New Zealand passport holders do not require a visa to visit Austria.